The last project I worked on at The Courier was a comprehensive guide to mental health and disability services in NE Iowa. For the project, we first wanted to explain the MHDS system to our readers and how it works. It’s a relatively new system with a lot of moving parts and no good way to search for services. We really wanted to help residents and families in need of these services, so we designed everything — from the wording we used to the way items were laid out — to be focused on our readers. After laying out the details of the new system, we wanted to allow our readers to search for services near them. A map seemed like an obvious choice; but we wanted to do more than just have them search for their address and plot a dot on the map. First, the providers are plotted on the map. Then, we ask the reader to type in their address, which is plotted on the map using jquery-geocodify. They also have a second option for radius, which will be used to determine how many providers are within whatever radius they have given. They have four options: 5, 10, 25 and 50 miles. I’ve pulled out just this part of the mental health project and open-sourced it. You can view the full code over at my Github page. The demo uses data on mental health providers, which is contained in this JSON file, and plots them on the map based on each provider’s latitude and longitude coordinates. Note: This walkthrough assumes a decent understanding of Leaflet. I’m also using Leaflet-Awesome Markers and Font Awesome in this project. The changeCircleRadius function is called anytime the radius is changed on the page. It first calls the pointsInCircle function, which we will define later, and then sets the radius of the circle using Leaflet’s setRadius function for circles. Leaflet uses meters, so we will need to convert miles to meters using the milesToMeters function, which will be defined later. The mile’s value is contained within the DIV with the id of radius-selected. We’ll grab the value, which is the radius in miles, convert it to meters and then set the radius of the circle using Leaflet. The geocodePlaceMarkersOnMap function is called every time the reader enters an address into our geocoder and presses enter. It passes with it the location of their address, which we get from jquery-geocodify. With this function, we will create both a circle and a marker on top of the given address. First, we set the view of the map based on this location and remove the circle on the map if there already is one. Then we actually create a circle and set how large it is based on the radius set by the user. We then remove the marker if it’s already on the map and create a new one. When we create a new marker, we’ll set it to draggable and set its dragend method to reset the view of the map every time the reader drags the marker somewhere on the. It then calls the pointsInCircle function, which we will define next. Finally, we’ll call the same pointsInCircle function and add the marker to the map. The pointsInCircle function is the last function called when one of two things happen: the user enters an address or the user drags the marker on the map. Its purpose is to find out how many markers on the map are within the circle we created and then display that number in the legend. Fortunately, Leaflet has a really handy distanceTo method, which determines how many meters are within two points. It uses the two points’ latitude and longitude coordinates to find this out. With the pointsInCircle function, we first capture the lat, long of the circle we’re putting on the map. We then loop through our providers.json file, find the latitude and longitude coordinates of each object and determine how far it is from our circle using the distanceTo method. We then decide if that amount is higher or lower than the radius set by the user. If it is lower, we add it to a counter. When we’re done, that counter will equal the number of markers within the selected radius. It will be put on the map under the “Results” header. The final piece is to add the variables we’re using to the top of the script file. We’ll also add the milesToMeters function, which converts miles to meters. I hope this walkthrough helps fellow Leaflet users! If you have any questions, leave them in the comments. An important trait for programmers to adopt, especially for those who are writing code on deadline, is laziness. While that sounds counter-productive, it can be incredibly beneficial. The more complicated your project, the more libraries you will likely use, which means a lot of tedious work putting all those files in the new directory. And that’s before you even start to code. If you want your projects to have a similar look to them (which we do at the Courier), you will need to create code that you can to replicate in the future. And then every time you want to use it, you will need to rewrite the same code or, at the very least, copy code from your old projects and paste it into your new project. I did this for a long time. Whenever I was creating a new app, I’d open a bunch of projects I’ve already completed, go into their CSS and JS files, copy some of it and paste it into the new files. It was maddening because I knew with every new project, I would waste hours basically replicating work I had already done. This is where laziness pays off. If you are too lazy to do the same things over and over again, you’ll start coming up with solutions that automatically does these repetitive tasks. That’s why many news apps teams have created templates for their applications. When they create new projects, they start with this template. This allows their apps to have a similar look. It also means they don’t have to do the same things over and over again every time they are working with a project. App templating is something I’ve dabbled with before. But those attempts were minor. For the most part, I did a lot of the same mind-numbing tasks every time I wanted to create a map, for instance. Fortunately I found a good solution a few months ago: Yeoman, which is dubbed “the web’s scaffolding tool for modern web apps,” has helped me eliminate much of that boring, repetitive work. Yeoman is built on three parts. The first is yo, which helps create new applications and all the files that go with it. It also uses Grunt, which I have come to love. Grunt is used for running tasks, like minifying code, starting a local server so you test your code, copy files into new directories and a whole bunch of other things that makes coding quicker, easier and less repetitive. In Yeoman, generators are created. A generator makes it easy to create new apps using a template that’s already been created. You can either create your own generator or use one of the 400+ community generators. The generators themselves are directories of files, like images, JS files, CSS stylesheets, etc. The advantage of using generators is you can create a stylesheet, for instance, save it in the generator directory and use that same stylesheet with every new project you create. If you decide to edit it, those changes will be reflected in every new project. When you use a generator, those files are copied into a new directory, along with Grunt tasks, which are great for when you are testing and deploying your apps. Yeoman also has a built-in prompt system that asks you a series of questions whenever you create an app. This helps copy over the appropriate files and code, depending on what you are trying to make. I decided I would take a stab at creating a generator. The code is here, along with a lot more explanation on how to use it. Basically, I created it so it would be easier to produce simple apps. Whenever I create a new Leaflet map, for instance, I can run this and a sample map with sample data will be outputted into a new directory. I also have a few options depending on how I want to style the map. I also have options for different data types: GeoJSON, JSON with latitude and longitude coordinates and Tabletop. What files are scaffolded out depends on how you responded to the prompts that are displayed when you first fire up the generator. There is also an option for non-maps. Finally, you can use Handlebars for templating your data, if that’s your thing. My hope is to expand upon this generator and create more options in the future. But for now, this is easy way to avoid a bunch of repetitive tasks. And thus, laziness pays off. If you are interested in creating your own generator, Yeoman has a great tutorial that you should check out. Crime maps are a big hit at news organizations these days. And with good reason: Good crime maps can tell your readers a whole lot about crime not only in their city but their backyard. For the last year and a half, we’ve been doing just that. By collecting data every week from our local police departments, we’ve been able to provide our community a great, constantly updated resource on crime in Waterloo and Cedar Falls. And we’ve even dispelled some myths on where crime happens along the way. The process, which I’ve blogged about in the past, has evolved since the project was first introduced. But basically it goes like this: I download PDFs of crime reports from the Waterloo and Cedar Falls police departments every week. Those PDFs are scraped using a Python script and exported into an CSV. The script pulls out reports of the most serious crimes and disregards minor reports like assistance calls. The CSV is then uploaded to Google spreadsheets as a back up. We also use this website to get latitude, longitude coordinates from the addresses in the Google spreadsheet. Finally, the spreadsheet is converted into JSON using Mr. Data Converter and loaded onto our FTP server. We use Leaflet to map the JSON files. We’ve broken the map into months and cities, meaning we have a map and a corresponding JSON file for each month for both Waterloo and Cedar Falls. We also have JSON files with all of the year’s crime reports for both Waterloo and Cedar Falls. The resulting maps are great for readers looking for detailed information on crime in their neighborhood. It also provides plenty of filters so readers can see what areas have more shootings, assaults, burglaries, etc. But it largely fails to give a good overview of what areas of the cities had the most reported crimes in 2013 for two reasons: 1) Because of the sheer number of crime reports (3,684 reports in 2013 for Waterloo alone) and the presence of multiple reports coming from the same address, it’s nearly impossible to simply look at the 2013 maps and see what areas of the cities had the most reports, and; 2) The JSON files containing all of the year’s reports runs well on modern browsers but runs more slowly outdated browsers (I’m looking at you, Internet Explorer), which aren’t equipped to iterate over JSON files with thousands of items. As a result, I decided to create separate choropleth maps that serve one purpose: To show what areas of the cities had the most reported crimes. The cities would be divided into sections and areas with more crimes would be darker on the map, while the areas with fewer crimes would be lighter. Dividing the city into sections would also mean the resulting JSON file would have dozens of items instead of thousands. The map would serve a simple purpose and load quickly. What would the areas of the cities actually look like? I’ve been fascinated with hex maps since I saw this gorgeous map from the L.A. Times on 9/11 response times. The map not only looked amazing but did an incredibly effective job displaying the data and telling the story. While we want our map to look nice, telling its story and serving our journalistic purpose will always be our No. 1 goal. Fortunately, hex maps do both. And even more fortunately, the process of creating hex maps got a whole lot easier when data journalist Kevin Schaul introduced a command line tool called binify that turns dot density shapefiles into shapefiles with hexagon shapes. Basically the map is cut into hexagon shapes, and all the points inside each hexagon are counted. Then each hexagon is given a corresponding count value for the number points that fall in between its borders. 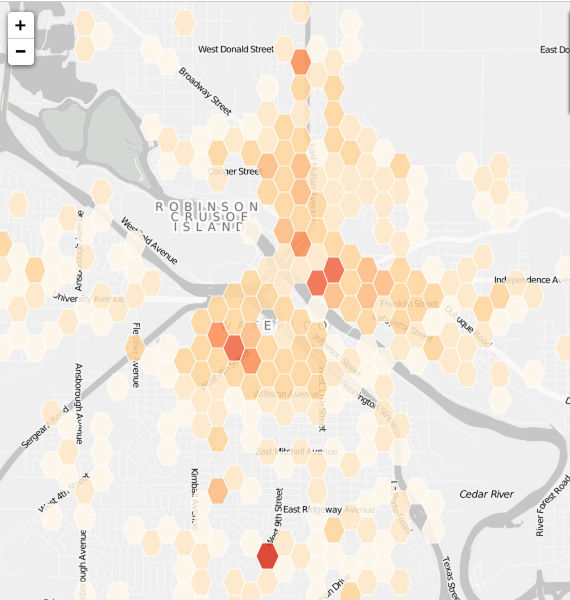 I used binify to convert our 2013 crime maps into hex maps. As I mentioned earlier, we started out with CSVs with all the crimes. My workflow for creating the hex maps and then converting them into JSON files for Leaflet is in a gist below. It utilizes the fantastic command line tool og2ogr, which is used to convert map files, and binify. # We start with a CSV called "crime_master_wloo_violent.csv" that has violent crime reports in Waterloo. # Create a file called "crime_master_wloo_violent.vrt"
# Change OGRVRTLayer name to "wloo_violent"
# Add name of lat, long columns to "GeometryField"
# Convert binified shp into JSON file called "crime_data_review_violent"
The above shows the process I took for creating our hex map of violent crimes in Waterloo. I duplicated this process three more times to get four maps in all. One showed property crimes in Waterloo, while the other two show violent and property crime in Cedar Falls. * Note: For more information on converting shapefiles with ogr2ogr, check out this blog post from Ben Balter. Also, this cheat sheet of ogr2ogr command line tools was invaluable as well. Another great resource is this blog post on minifying GeoJSON files from Bjørn Sandvik. While the post deals with GeoJSON files specifically, the process works with JSON files as well. Minifying my JSON files made them about 50-150 KB smaller. While it’s not a drastic difference, every little bit counts. One last note: The map is responsive. Check it out. Last Tuesday was election night in the Cedar Valley. While we didn’t have a huge number of contested races on the ballot, we did have a mayor’s race in Waterloo and Waverly, Iowa, as well as city council races in several area towns. As NPR’s Jeremy Bowers proudly proclaimed, election nights are exciting times for news nerds. This election, we decided to do a little bit of experimenting. Before the election, we posted biographical information for all the candidates running in a contested race in Waterloo, Cedar Falls and Waverly. We also promoted other races in smaller towns. This gave our readers a good overview of the races on the ballot and information on the candidates. And best of all, it was all in one place. Three reporters were responsible for getting the biographical information for each candidate and entering it online. We used a Google spreadsheet to store the information. This allowed the reporters to enter the information online themselves. I could then go into the spreadsheet, edit the text and make sure it was formatted correctly. We then used Tabletop.js to import the data into our app and Handlebars.js to template it. The basic setup for the app is available on my Github page. This is a very similar setup mentioned in my last blog post. Before the app went live, I exported all the data in the Google spreadsheet into JSON format using a method mentioned here. I did this for two reasons: 1) It spend up the load time of the app because browsers didn’t have to connect to the spreadsheet, download the data, format the data into JSON (which is what Tabletop.js does with the data in this app) and then display it online using templates rendered in Handlebars.js. Instead, it’s already downloaded, formatted into JSON and ready to be templated. And: 2) Tabletop.js has a bug that may cause some readers not to see any of the data at all. I wanted to avoid this problem. The night of the election, we wanted to update the election results live. And we wanted to use the same app to display the results. Fortunately, the process was easy to do: I added new columns in our spreadsheet for vote totals and precincts reported. The new data was then pulled into our app and displayed with simple bar charts. To display the results live, we had to ditch the exported JSON data and use the Google spreadsheet to power the app. This allowed us to update the spreadsheet and have the results display live on our website. We had one reporter at the county courthouse who punched in numbers for our Waterloo and Cedar Falls races. 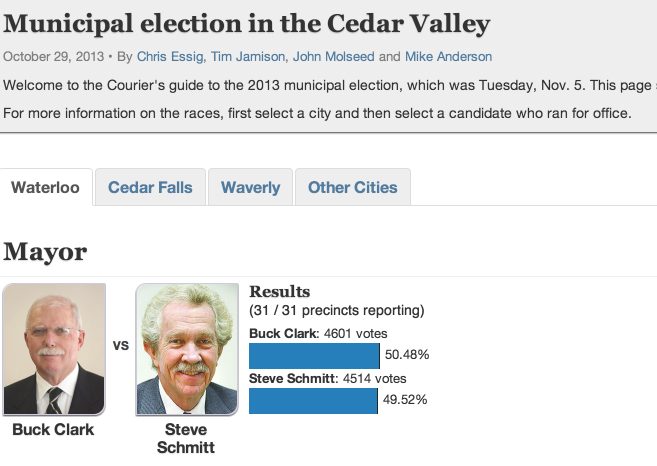 We had another reporter in Waverly who punched in results for races in that town. And we had another reporter in the newsroom who was monitoring the races in rural towns and giving me updated election results to enter into the spreadsheet. The workflow worked great. While most news outlets were waiting for the county websites to update with election results, we were able to display the results right away. Unfortunately, the Black Hawk County website never wound up working on election, making our app the only place readers could go to get election results. Our effort paid off: The app received about 11,500 pageviews, with about 10,000 of those pageviews coming the night of election (about 7,000 pageviews) and the following day. The app was more popular than any single story on our website for the month of October and November. Reporters at the party headquarters said many of the candidates first tuned into the local television station to get election results but quickly went to our webpage when they realized we were the only ones with updated results. In fact, Waterloo’s mayor found out he won his race by looking at our website. Here’s a photo of him checking out our website on election night. Which leads me to my last point: You’ll notice how our mayor is checking out the results on a smartphone. Our app (like all of our apps) was responsively designed, which means it looks great on mobile phones. It’s critical that news producers make sure their apps work on mobile. It’s pretty much mandatory. Because as our mayor shows, people love checking the news on their phones. We at The Courier ran into an interesting problem last week that I’m sure other news organizations run into as well. Every year, The Courier puts on a Best of the Best competition. We select a series of categories like food, dining, jewelry stores, etc. and ask our readers to pick the best business in town for each category. The businesses with the most votes in each category are rewarded by being featured in the newspaper. They also get plaques they can hang at their business to show off their nifty award. We have several forms that people use to submit their votes. They are allowed to type in their favorite businesses, instead of pick from a field of choices. We store their votes in a database. We then spit out the data into a spreadsheet with all the votes. Each row is one vote. For week two, we had a spreadsheet with 3,000+ rows of entries. To view that spreadsheet, click here. We have a row for entry id, category, entrant id and the actual entry. The “entry” field is what we will focus on throughout this walkthrough. The problem: Everyone has their own spelling for businesses in the “entry” column. For instance, “Famous Footwear” was spelled “Famous Footwear, Cedar Falls” and “Famous Footware”, it sometimes was partially upper-cased and sometimes it was misspelled altogether. How do we merge all those different spellings for businesses into one spelling and count them up? We could do it by hand, of course, but that is painful, tedious and time-consuming. We could also pay a company to do it but that could be expensive. At least one company that we know of charges $4,000 for such serves. Fortunately there is a better option out there that is FREE and not horribly time consuming. 1. First download a program called OpenRefine and open it up. This program was originally created by the fine people at Google and then later open sourced. Its purpose is to clean “dirty” data (like our user-submitted data). Their website has three videos on how to use the program that you should definitely check out before firing it up. 3. In OpenRefine, there is a little arrow next to the column title (“entry”). Click that to see a list of options for cleaning the data. If you look under “Edit cells” and “Common transforms,” you’ll see a list of common edits like trimming the leading and trailing whitespace in the entries. So ” U.S. Cellular ” would be changed to “U.S. Cellular” (notice how the white space is removed). 4. The real magic, however, is in the cluster function. This uses algorithms to find different spellings for the same business and then allows you to pick ONE common spelling for ALL of them. – This makes it much easier down the road to count how many times a particular business was voted on because we don’t have a wide range of spellings for that business. Instead, we can narrow down it to just a couple of spellings. Or if we are really lucky, we can convert all of the different spellings into one common spelling using the algorithms. – To pull them up, click “Facet” then “Text facet”. That will pull up a list of unique entries in the “entry” column. If you click “count”, you can see how many times a business was entered. For instance, “Scheels” was voted on 115 times. Then click “Cluster”. – Clustering is one of OpenRefine’s most powerful tools. When you open this section up, you’ll see a list of clusters with different spellings for what the algorithm thinks is the same business. – If those are accurate clusters — or if the different spellings listed in the cluster really are different variations for the same business — you can select the check box under “Merge?” to convert all of those spellings in the cluster to the same, single spelling. – OpenRefine comes packed with several clustering algorithms. You can change “Method,” “Keying Function” etc. to check them all out and see which ones work best for you. When you’re done with one algorithm, you can select “Merge Selected & Re-Cluster” to mess with other algorithms or “Merge Selected & Close” to close out of this section. – I think it’s best to go through all of the algorithms and play around with them a bit to cluster as many businesses together as you can. Note: We used OpenRefine to cluster together different spellings for the same business. Now we’ll use Excel to create a list of uniquely-titled businesses and how many times those were voted on. – After we are done, we will still probably have different spellings for the same business. It’s likely that the OpenRefine algorithms will be able to find many of the wide range of spellings for a particular business but not all of them. When you allow users to type in their own business names, you open yourself up to A LOT of spellings for the same thing. – But the hope is we can narrow this list of spellings down to as few as possible so the manual work of tallying up the votes is as painless as possible. – Right now, we still have a spreadsheet that is about 3,000 rows long. The advantage is we have limited the number of different spellings for all the businesses people have voted on. What we need to do now is create a list of uniquely titled businesses and how many times they were voted on. 6. A lot of people accidentally put in their phone number for the entry. Some entered “====”. Others didn’t fill in the spot at all. We need to get rid of all those. – I first moved the “entry” column from column E to column A. I then sorted the data from A to Z so the entries with phone numbers are at the top. I deleted those. I then sorted it from Z to A to put the empty entries at the top. And then I deleted those too. – We can also delete the “entry_id” and “entrant_id” columns because for our purposes, they are useless. – For those following along, here’s what my spreadsheet looks like now. – One tricky aspect of this is people can vote for the same business in different categories. So we need to make sure the business and the category of each vote stay to together. That way, a vote for “Ace Hardware” in the “Hardware Store” category doesn’t count the same as a vote for “Ace Hardware” in the “Buy a Lawnmower” category. – A2 is our entry column and B2 is our category column. The ” | ” isn’t necessary but is useful is we want to break apart this column again in the future. We then fill down that function to the last row in the spreadsheet using the fill handle. – Here’s what my spreadsheet looks like now. Tip: When using formulas on big spreadsheets, Excel tends to slow down A LOT. So when you are done using a formula, you can copy it and paste just the values (not the formulas) in its place to help Excel run smoother. I do this throughout the walkthrough to make our spreadsheets much easier work with. 8. The next step is to get a list of uniquely-titled businesses and categories. The best walkthrough I found to accomplish this was this one from Microsoft. Complete steps 1-6 under “Count the number of unique values by using a filter” to create a new column of uniquely-titled businesses. – I also deleted the entry and cat_id columns. We will not need those any more. – We are down to under 1,000 rows of unique-titled businesses and categories. And honestly, if I would have messed with the algorithms in OpenRefine more, I could have narrowed that list even farther. 8. Now we have a column for each vote (column A) and column with each unique business and category (column B). We need to count how many times each unique business and category (column B) was voted on — or how many times each unique business and category appears in column A. – This basically goes through each row in column A and if it is equal to what is in column B, it adds one. Then its adds all that together. The result is how many times our unique business and category was voted on. Note: The dollar signs in the formula basically means go through every row in column A. 9. We’re almost done. All we need to do now is split up our business category column into a column for businesses and a column for categories. – Do this by first copying and pasting the value of the “unique_entry_cat” column into a new column. We have to do this first, otherwise our sum formula in our “count” column won’t work properly. – We then break apart that new column using this method and use “|” as the delimiter to split them up. Then delete the old columns and copy and paste the values over the formulas in the spreadsheet. 10. Finally, copy and paste the values of the columns onto a new spreadsheet and custom sort the spreadsheet first from A to Z for the category column and then largest to smallest in the count column. – Here’s what the final spreadsheet looks like. Quick: Name five people you know who don’t have a smartphone. Stumped? Yeah, me too. The fact is more and more people have smartphones and are using them to keep up with the world. What does that mean for news app developers? We need to be especially conscience of the mobile platform and make sure everything we build for the web is compatible on the smallest of screens. One great way to do this is creating apps through responsive design. The idea behind responsive design is creating one web page for all users, as opposed to making separate pages for desktop and mobile computers. Then we simply add, rearrange, subtract or tweak features on a web page based on the size of the browser the user has when they are viewing the app. Maps can be difficult to manage on mobile platforms, especially when you add in legends, info boxes, etc. But they are not impossible. Fortunately Leaflet, an alternative to Google maps, is designed to work especially well on mobile platforms. In this example, we will be loading data into a Google spreadsheet and using Leaflet to map the data on a responsive map. Before we start, it would probably be best if you familiarize yourself with Leaflet. Fortunately, their website has some wonderful walk-throughs. I’d recommend going through this one before going anything further. Now, go to my Github page and download the template. The Readme file includes instructions on how to set up a basic map using Google spreadsheets and Tabletop.js, which is a wonderful tool that allows us to do all kinds of things with data in a Google spreadsheet, including map it using Leaflet. After you have followed the instructions on my Github page, you should have a map ready to go. All you have to do is go into the index.html page and edit the title of the map, as well as add your own information into the “sidebar_content” div. Also make sure you add your name to the credits because you deserve credit for this awesome map you are putting together. Now open up your map in a browser. If you rearrange the browser window size, you’ll notice that the map rearranges its size. The other components on the page also automatically readjust. Some of this is done with the Bootstrap web framework, which was designed with responsive designing in mind. I’ve also added my own CSS. One easy thing I’ve done with elements on the page is declare their widths and heights using percentages instead of pixels. This ensures that the components will automatically be adjusted regardless of the screen size. The map’s height is 98 percent and width is 100 percent, ensuring it changes its size when the browser changes its size. If we set it to 600 pixels wide, the map would stay 600 pixels wide, even when the browser was adjusted. The sidebar’s “right” position is set to 1 percent. This ensures that the sidebar will appear only 1 percent from the right side of the page. Additionally, its “top” position is set to 2 percent. This, effectively, pushes it to the top right corner of the screen. We also used percentages to declare widths, heights and padding lengths for the sidebar. Basically what the above code is saying is: If the browser is 625 pixels wide or smaller, apply the following CSS styles. These styles would therefore apply to almost all mobile phones. So what you are saying to the browser is: If this is a mobile browser, apply these styles to the elements on the page. The first thing we do is hide the “sidebar_content” div, which is within our main “sidebar” div. Besides the “sidebar_content” div, we also have a div within the “sidebar” div called “sidebar_header” for our title. The template sets the title to “Tabletop to Leaflet” initially, although you should change that to match your project. We hide the “sidebar_content” div with the property “display: none.” Hiding it ensures that the only thing left in our “sidebar” div is the title. Then the sidebar is pushed to the top left corner of the page using absolute positioning. – The “description_box” div is also styled similarly to the “sidebar” div. The big difference is the “description_box” div is hidden by default because we only want it shown if we are on a mobile phone. The button with the class “toggle_description” is also hidden by default. Now we do the opposite with the “toggle_description” when compared to what we did with the “sidebar_content” div. As a noted above, when someone clicks on that button, jQuery toggles between hidden and shown on the button with the class “toggle_description”. It is hidden by default, so it is shown when the user first clicks it. Then when the user clicks the blue X button (which also has the class of “toggle description”), the box disappears. A similar philosophy is in place to hide and show the credits box. That should give you a good idea of what is happening with this map. Feel free to fork the repo and create your own awesome maps. Have any questions? Don’t hesitate to leave a comment.